A typical earthing electrode (left of gray pipe), consisting of a conductive rod driven into the ground, at a home in Australia. Most electrical codes specify that the insulation on protective earthing conductors must be a distinctive color (or color combination) not used for any other purpose. Electrical circuits may be connected to ground (earth) for several reasons. 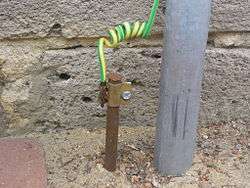 In mains powered equipment, exposed metal parts are connected to ground to prevent user contact with dangerous voltage when electrical insulation fails. Connection to ground also limits the build-up of static electricity when handling flammable products or electrostatic-sensitive devices. In some telegraph and power transmission circuits, the earth itself can be used as one conductor of the circuit, saving the cost of installing a separate return conductor (see single-wire earth return). Long-distance electromagnetic telegraph systems from 1820 onwards used two or more wires to carry the signal and return currents. It was then discovered, probably by the German scientist Carl August Steinheil in 1836–1837, that the ground could be used as the return path to complete the circuit, making the return wire unnecessary. However, there were problems with this system, exemplified by the transcontinental telegraph line constructed in 1861 by the Western Union Company between Saint Joseph, Missouri, and Sacramento, California. During dry weather, the ground connection often developed a high resistance, requiring water to be poured on the ground rod to enable the telegraph to work or phones to ring. In a mains electricity (AC power) wiring installation, the term ground conductor typically refers to three different conductors or conductor systems as listed below. Equipment earthing conductors provide an electrical connection between non-current-carrying metallic parts of equipment and the earth. According to the U.S. National Electrical Code (NEC), the reason for doing this is to limit the voltage imposed by lightning, line surges, and contact with higher voltage lines. The equipment earthing conductor is usually also used as the equipment bonding conductor (see below). Equipment bonding conductors provide a low impedance path between non-current-carrying metallic parts of equipment and one of the conductors of that electrical system's source, so that if a part becomes energized for any reason, such as a frayed or damaged conductor, a short circuit will occur and operate a circuit breaker or fuse to disconnect the faulted circuit. The earth itself has no role in this fault-clearing process since current must return to its source; however, the sources are very frequently connected to earth. (see Kirchhoff's circuit laws). By bonding (interconnecting) all exposed non-current carrying metal objects together, they should remain near the same potential thus reducing the chance of a shock. This is especially important in bathrooms where one may be in contact with several different metallic systems such as supply and drain pipes and appliance frames. The equipment bonding conductor is usually also used as the equipment earthing conductor (see above). A grounding electrode conductor (GEC) connects one leg of an electrical system to one or more earth electrodes. This is called "system grounding" and most systems are required to be grounded. The U.S. NEC and the UK's BS 7671 list systems that are required to be grounded. The grounding electrode conductor connects the leg of the electrical system that is the "neutral wire" to the grounding electrode(s). The grounding electrode conductor is also usually bonded to pipework and structural steel in larger structures. According to the NEC, the purpose of earthing an electrical system is to limit the voltage to earth imposed by lightning events and contact with higher voltage lines, and also to stabilize the voltage to earth during normal operation. In the past, water supply pipes were often used as grounding electrodes, but this was banned where plastic pipes are popular. This type of ground applies to radio antennas and to lightning protection systems. Permanently installed electrical equipment usually also has permanently connected grounding conductors. Portable electrical devices with metal cases may have them connected to earth ground by a pin in the interconnecting plug (see Domestic AC power plugs and sockets). The size of power ground conductors is usually regulated by local or national wiring regulations. A functional earth connection serves a purpose other than providing protection against electrical shock. In contrast to a protective earth connection, a functional earth connection may carry a current during the normal operation of a device. Functional earth connections may be required by devices such as surge suppression and electromagnetic-compatibility filters, some types of antennas and various measurement instruments. Generally the protective earth is also used as a functional earth, though this requires care in some situations. Voltage is measured on an interval scale, which means that only differences can be measured. To measure the voltage of a single point, a reference point must be selected to measure against. This common reference point is called "ground" and considered to have zero voltage. This signal ground may or may not be connected to a power ground. A system where the system ground is not connected to another circuit or to earth (though there may still be AC coupling) is often referred to as a floating ground or double-insulated. Isolation is not a mechanism that defeats grounding. It is frequently used with low-power consumer devices, and when electronics engineers, hobbyists, or repairmen are working on circuits that would normally be operated using the power line voltage. 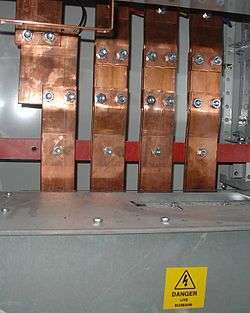 Isolation can be accomplished by simply placing a "1:1 wire ratio" transformer with an equal number of turns between the device and the regular power service, but applies to any type of transformer using two or more coils electrically insulated from each other. ↑ Beltz, R.; Cutler-Hammer, Atlanta, Georgia; Peacock, I.; Vilcheck, W. (2000). "Application Considerations for High Resistance Ground Retrofits in Pulp and Paper Mills". Pulp and Paper Industry Technical Conference, 2000. ↑ Electrical and electronics diagrams, IEEE Std 315-1975, Section 3.9: Circuit return. ↑ "ESD Prevention Measures Part 2: Using Anti Static Mats by Doug Wagner". Bennett & Bennett. Retrieved May 15, 2014. ↑ "Wrist Strap Shown with mat and Common Point Ground System (CPGS)". Bennett & Bennett. Retrieved April 23, 2014.